The holidays can be extremely stressful for a lot of people, especially if you’re on a budget. The gift giving, holiday parties, and extra outings (gas + eating out) can often add unexpected expenses to an already tight budget. Don’t let the holiday spending affect your ability to enjoy the merriment. 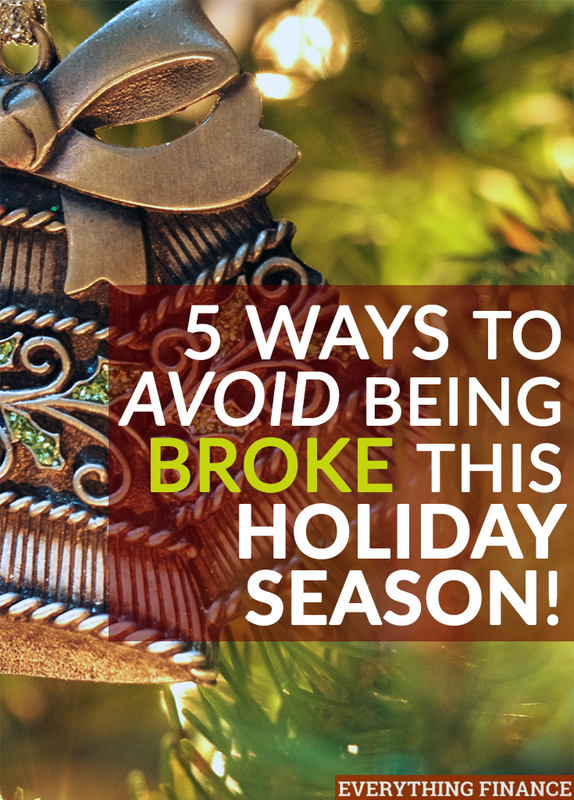 Here are five ways to avoid going broke this holiday season. Hands down one of the fastest ways to go broke is to splurge with your gift giving. If you’re one of those people that find more joy in giving than receiving, you could be especially susceptible to this pitfall. Manage your gift giving early by limiting who you purchase presents for. Do you really need to get your neighbors a gift? What about your children’s teachers? Cut out the ones who are the “nice to haves” and stick to the “must-haves.” Let your guilt subside by promising yourself you’ll budget better next year. If your budget is going to take a major hit, you simply don’t have the means to be buying gifts for everyone. If there are still a slew of people on your gift giving list, consider creating homemade gifts to tame in the cost. Pinterest has a lot of ideas, like a cookie-in-a-jar or hot chocolate mug set. You can also bake some goodies and call it a day. These days, it really is the thought that counts. If friends and family know money is tight, they should understand. Always remind yourself of the true reason for the season. Instead of opening your wallet, give the gift of time by donating your time to helping others. Offer to babysit for your friend’s kids so they can enjoy a night out. Show your children the spirit of the season by volunteering at a food pantry or soup kitchen. Instead of giving your children or spouse gifts, spend an entire day together doing holiday-related things. Most family members, especially children, would rather spend time with their loved ones creating long-lasting memories than receive gifts that will be forgotten by next year’s holiday season. You don’t need to buy the biggest tree or splurge on photo cards. Tame your expenses by thinking of less expensive alternatives. Instead of customized photo cards, how about sending handwritten cards instead? You can still take part in the holiday spirit without breaking the bank. This tip will be one that will help you for future years. From now on, commit to opening a “Holiday Fund” and set aside either $10, $25, or $50 from every paycheck to go toward your savings. This will help you find that extra $500 or so dollars you need to fund all your needs and wants for the following holiday season. How do you avoid going broke during the holidays? Do you budget beforehand, have a low-key celebration, or only buy for a certain amount of people?